Last Sunday was beautiful, warm and sunny with a gentle breeze in the air and a feel for adventure or something different, but definitely not staying in Manhattan. So my wife, my son and I decided to make a little escapade upstate, to the Hunter Mountains. We happen to know some friends who have a really nice house lost in the woods with an amazing view on the Hunter Mountains, and decided to pay them a visit. We rented a car, of course, like most New Yorkers do, because there is no point to have a car in New York when you think that walking or taking the metro is way faster and cheaper in many ways (parking, insurance, gas, tickets, repairs, etc...), and off we went, bright and early to fully take advantage of the day before the sun goes down. The "87 North" road is quite fluid, pleasant and tranquil when you leave New York early, although coming back to the city is different matter especially on Sunday night. We left the highway behind us by taking the exit 20 and drove up on small roads to the village of Hunter, and a bit further to reach our friend's home. However, driving up there has a certain charm and Fall season makes it even more charming with all the different leaf's colors and shades in the surrounding forests, ranging gradually from dark green to bright yellow, orange, red and brown. I must say, when you don't own a car, these few little trips here and there, even if only a few hours from the city, are really enjoyable and exciting for the whole family and always make us feel like we could conquer the world (and of course like we should own a car...). Anyhow, after about 2 hours and a half driving and many curvy small roads passing through quaint small (and somewhat boring, far too quiet or even creepy) villages, we finally arrived at destination. Wow! It wasn't our first trip to the mountains (either in the States or in Europe) but it always takes us by surprise and often triggers the same happy reaction on our faces; suddenly, we could breathe freely and intensely the clean, fresh and pure mountain air. What a blessing! Surrounded by trees, our friend's house faces South with an incredible, nearly 180 degrees, view on the forested mountains. To admire daily this magnificent scenery, their house possesses a large patio overlooking their sloping garden ending with a large pond a bit further down, sliding into the forest and giving way to the rest of the mountain tops in the background. The sunbathed place is a haven of rest and peacefulness. No more of the honking, yelling, spitting, cursing, battering or any other annoying city noises, just the barely interrupted sounds, almost silence, of the surrounding nature watching slowly time passing by, paced by the multiple rhythms of all living things that inhabit her. I spend a moment contemplating this decor, paying attention to each detail and recording them in my memory to enhance future bad, inconvenient days in the city. Don't get me wrong, I love New York (she has some much to give...), but sometimes the stress and the energy of the city, intermingled with all the annoyances and the tiredness of our everyday life in the "Big Apple", demand such little reveries. However, that is exactly why we decided to drive up there and I had the firm intention to fully experience it, especially on such a sunny day. While the kids were playing around interminably changing places from the patio to the garden, my wife and my wife's friends started with Champagne: a chilled bottle of (Gérard) Demilly de Baere "Cuvée Rare" Brut NV Blanc de Blancs; while my friend and I opened a beer to begin with before joining the ladies. My friend his truly a talented, old school chef, everything handmade and no recipes. Everything is prepared from old traditional recipes passed on from his mum, enhance with his own twists. We both talk a lot and the discussions were battering all over the house with us in the kitchen (him cooking, me watching and somewhat trying to learn), the wives sitting in the living room and the kids pretty much everywhere else. Quiet and lonely, in the corner of one of the open windows in the living room, I couldn't avoid noticing the attractive garnet liquid gently resting in a decanter next to an empty bottle of Bordeaux. I was surprised because I know that my friend usually prefers Burgundy. He saw my eyes and couldn't resist showing me the bottle... but it needed to open up a bit more and we will drink it with the main course. We sat outside and joined the wives with a glass of Champagne for a toast to this beautiful afternoon and friendship. Demilly de Baere "Cuvée Rare" Brut NV Blanc de Blancs ($35-$40 in NYC) has always been amongst some of my favorite Champagnes. Clean, crisp, refreshing, medium bodied and forward without being heavy with just the right touch of "yeastyness" and an amazing balance. Lovely and definitively food friendly. We set the table outside on the sunbathed patio, once again what a view and what a pleasurable moment under the sun. Although, it was beginning of November, one could have believed that it was summer. My friend, who only believes in seasonal cooking, served us a red cabbage soup as a starter which was pretty good. Then we moved on to the main course, roasted beef served with spaghetti squash cooked with white onions and garlic, paired with the Bordeaux that I was stalking for nearly the past hour and a half. You see, it is very difficult for me to resist to the temptation of tasting red Bordeaux. It is in me. Being born in Bordeaux, the passion for good food and especially good wine comes naturally. As the grandson of a local, artisanal winemaker from the Côtes de Bourg, who was also an excellent cook, I quickly learned how to pair food with wine, and how to appreciate them both respectively. My grandfather was growing all of his vegetables (potatoes, carrots, pumpkins, beetroots, salads, endives, artichokes, etc...), but also his own fruits (grapes, pears, apples, lime, cherry, apricot, prunes, blackberries, figs and even kiwis), his own nuts (hazelnut and whole nut) and his own herbs (dill, parsley, fennel, lavender, thyme, rosemary, etc..); in fact he was making all sort of things from "Paté" to desserts himself, he only bought the meats to his preferred "boucher", but most of all, he always had a bottle of the local wine on the table. Thus, my knowledge of wine started rather early for American standards, which is not unusual at all in France. Therefore, here are the reasons why I couldn't resist eyeing this Bordeaux bottle. 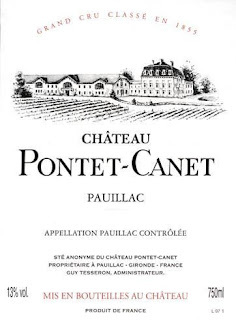 It was a Château Pontet-Canet, which happens to be one of my favorite Bordeaux wine and one of the most successful and up-and-coming reasonable values from Pauillac over this last decade. As a traveled wine buyer and Sommelier, going nearly each year to Bordeaux over the last 10 years for the Primeurs, I had the privilege to visit and taste Château Pontet-Canet numerous times. Year after year, I have always been impressed by the low-key profile of the owner, Mr. Alfred Tesseron, a discrete and polite gentleman with the energetic and mischievous eyes of a kid that has something in mind completed by a mystic smile of someone that knows better. Behind its bonhomie and gentle attitude, hides an intelligent, strategic and skillful mind, which has been one of the most supportive pillars of this Pauillac benchmark. In 1975, Guy Tesseron, a Cognac shipper who bought it from the Cruse family who previously owned it for 110 years, acquired Château Pontet-Canet. Late Gérard Tesseron who died of a heart attack recently and Alfred Tesseron, Guy's sons, slowly took over their father and gradually restructured the entire vineyard as well as renovating the cellar and the other buildings. The property, located south of Château Mouton Rothschild and Château d'Armailhac, in the heart of the Pauillac appellation, encompasses 80 hectares of vineyards on poor sand and gravel soils planted mainly with Cabernet Sauvignon, the signature grape to produce great Pauillac. Eventually gaining more recognition after years of hard work and devotion, their efforts where highly rewarded within this last decade more particularly with stunning, consistent value wines produced good year, bad year since the 2000 vintage. Even if the 2000, 2003 and 2005 are way to expensive for the average consumer, 2004 and 2006 can be somewhat considered has "potably" priced, and, however the 2002 remains the biggest bargain of the decade (in my opinion, far better than the critics and press anticipated). Once again, it is another proof that the 1855 classification has become too controversial and continues to provoke arguments and endless discussions when mentioned openly with Négociants, Courtiers and Chateau owners. Yet, Bordeaux is ruled by money, ancient Bourgeoisie and old fashioned protocols that the “Bordelais” tend to respect, enhance and exaggerate, creating blinders towards the rest of the world, narrowing their way of thinking and often making them believe that they are kings in their castles and that their wines are the best no matter what and have no equals nor real competition. All of this was true up until the 2000 Vintage but started to disappear in the eyes of the consumers and buyers of the rest of the world with the 2003 and 2005 vintage. When I say value, don't get me wrong, the 2005 vintage ranges between $120 and $180 a bottle in New York, which is still quite expensive for a 5th growth, but it is somewhat awfully cheap compared to some of the more famous Pauillac higher in the hierarchy of the 1855 Classification that are producing, for some of them, less complex and layered wines. Yet, and fortunately for us wine consumers, along the line of the 1855 Classification which has barely moved over the last century and a half, a fifth growth by traditions (unlike in California or else in the New world where people do whatever they want) should never be sold higher than any wines of the higher rank: a 5th growth should normally be cheaper than a 4th growth, and so on; which is the reason why Chateau Pontet Canet, if it continues to maintain its quality and if the classification continues to prevail, it will always remain a "good" value (to the people that can or are willing to afford it). However, after these little parentheses on Bordeaux, let's go back to our wine of the day to finish this post. Decanted for the past hour and a half at least, the wine was showing wonderfully. It exhibited an attractive, deep ruby-garnet color of good intensity and bright reflects. The nose was somewhat elegant and aromatic with expressive aromas of dark berry, leather, earth, pencil shavings intermingled with oak notes. The medium to full palate offered very good balance and texture, with good acidity and a firm yet integrated tannic structure. A touch dry, yet still offering plenty of generous dark berry fruit flavors mixed with earthy and woody notes on a more traditional Bordeaux way. The quality of the fruit, the balancing acidity combined with the tannins in the finish and the overall profile of this wine suggest that it could keep for quite a few more years. Overall, the wine clearly benefited from being decanted and it was a great experience, surely enhanced by the memorable view, the quality of the food and the "joie de vivre" that reign during the meal, sitting on that sunbathed patio. We enjoyed it with roasted beef and cheeses. For dessert, he prepared a succulent handmade"potiron" tart (a smaller European pumpkin), a classic in his house (like his famous onion tart usually served as an appetizer). Step into the Green! Drink more Biodynamic and Organic wines (and food) from sustainable culture and respect the environment.